The weather outside may be getting colder, but the Dean Aquatic Center is just beginning to heat up. The Albion men’s and women’s swimming and diving teams will compete in their first dual meet of the season on Saturday, Oct. 19 at Calvin College. With the first meet comes great excitement and anticipation for both the men and women. The men have similar ideas in mind. “Some of the goals I want the team to achieve this year are to get more records on the record board and show the MIAA conference that we can be a challenging opponent,” said Tom Parsons, Grandville sophomore. The men will look to Brian Fiorillo, Southgate senior, to help them achieve many of their goals. Fiorillo earned his second honorable mention All-American honor last season in the 100-yard freestyle. Last season as a team, the men finished fourth out of six at the MIAA championships and the women placed fifth out of seven, so both teams are looking to progress and improve. Their work began long before mandatory practices started earlier this semester, though. “We do not have an official off-season training program, but a large majority of the team train after the end of the official season and all throughout the summer,” Hargrove said. According to Julie Okorn, West Bloomfield senior, some swimmers even swim for club teams during the off-season as another way to stay in shape. 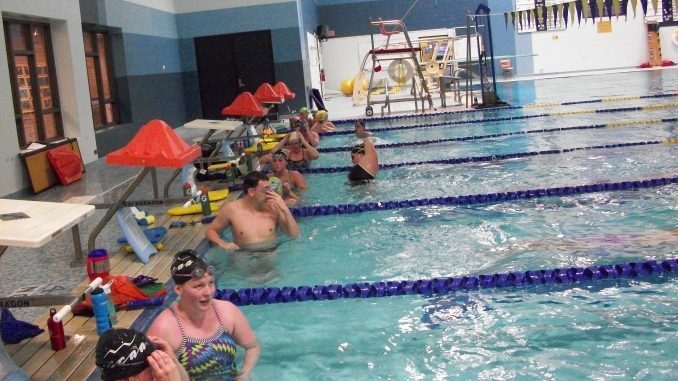 Not only do most of the swimmers train during their off-season, but because their season starts in the fall semester and carries over into the spring semester, they also have to train over the five-week winter break. Much of the training is individual but that changes towards the end of winter break. The team will train at the International Swimming Hall of Fame pool during their stay in Florida. With a tremendous amount of work being put forth all year long, both programs are hoping for the best, but even if times get tough and the teams face adversity, the support the teams give each other will always be there.